After all the debate and politicking, Jarvis Street got its bike lanes yesterday. Working a section at a time, an orange-vested road crew spent Sunday painting new lines, and erasing old ones. Jarvis Street’s reversible centre lane—which was able to flow either northbound or southbound, depending on traffic—was blasted off the street with a truck-mounted pressure washer (as seen in this extremely educational video from Waterblasting Technologies: “The Power of Water, Working for You!”). 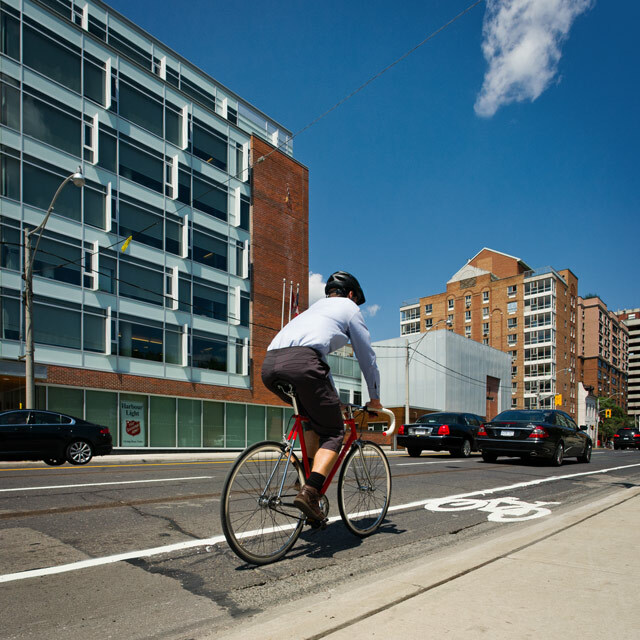 The northernmost stretch of bike lanes, from Charles Street to Gerrard Street, was the first to be completed. By early afternoon, the crew was concentrating on the southern part of the corridor, to Queen Street. Large trucks with orange canopies covering their open flatbeds carried materials up and down the road, while workers used hand-propelled carts to dispense white Lafrentz System 400 Cold Plastic road marking (“the same hard resin compound as that used to make plexiglass and dentures,” says the sales brochure) from five-gallon buckets onto Jarvis Street’s shoulders. Trailing behind the paint carts were other guys pushing other carts, similar to the kind used to paint lines on football fields. These secondary carts were filled with heaps of tiny, white glass beads, which, when applied to the markings while they’re still wet, embed themselves and help give the new lines their reflective quality. Not all the beads stick, and they have a tendency to blow in little drifts along the sides of the street. They refract sunlight, so anyone who rode a bike in the new Jarvis lanes yesterday, if they looked down and to the east, saw a rainbow.